All-in-one outdoor cooking convenience. The portable CADAC Carri Chef Combo barbecue with Chef Pan offers you an unequalled number of cooking solutions for your outdoor cooking needs. So if you're contemplating your next camping trip, caravanning holiday, or merely for your home patio or gardening entertaining. The chef pan and die-cast BBQ grill are non-stick coated for easy cooking and cleaning, with the pot stand is chrome nickel plated for durability. Easy to light and adjust thanks to the gas control valve and piezo ignition, the enamelled lid has a built in thermometer and adjustable stainless steel vent so you can accurately monitor and control the temperature without removing the lid. Using the convient individual bags and weighing only 18kg, It is light enough to take anywhere. In addition, it has a versatile condiment tray ans is also supplied with a free full-colour recipe book. 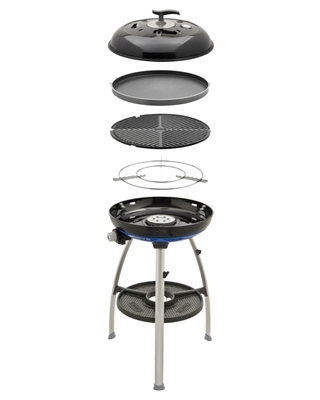 The BBQ is easy to assemble for easy transportation and is the ideal cooking companion for caravaning, picnicking, sports events or patio entertaining. The unit operates directly off a hose and regulator connected to larger type refillable gas cylinders. (Hose and regulator not included). Best camping BBQ by far. I also own a Weber Q and charcoal BBQ's that I love but for camping they are not as portable or versatile as the Cadac. The cooking space is also very generous. If your looking for a camping BBQ this is the one, they are great. This one replaces our last Cadac which we had for well over 12 years! It only came to an end because it was damaged in a crash otherwise it would still be going strong! Dont know about this particular one, as its his christmas present... but he has ranted and raved about how fantastic these are... whenever he sees another bloke with one (not being sexist... its generally a bloke thing), they can stand for hours talking about how great they are. So I have bought him one so I no longer have to do the cooking on holiday. His birthday presents for next few years are also sorted, as kids can buy him all the wonderful bits of kit that can add to it.... HAPPY HAPPY!! I first ordered this from Amazon who let me down with delivery. I needed this urgently for our holiday so placed the order with Camping world instead and received it next day as promised they also accepted my price check as it was cheaper on Amazon and they refunded the difference immediately. Great bit of kit, can cook virtually anything on it with all the attachments. Heats up quick cooking food very well. A must have for camping.